Minentle Nogaya 4, Ryon van der Berg 5, Maggie Philander (Rainbow Soupkitchen), Ashleigh Plaatjies 5, Shoeab Ahmed 4. 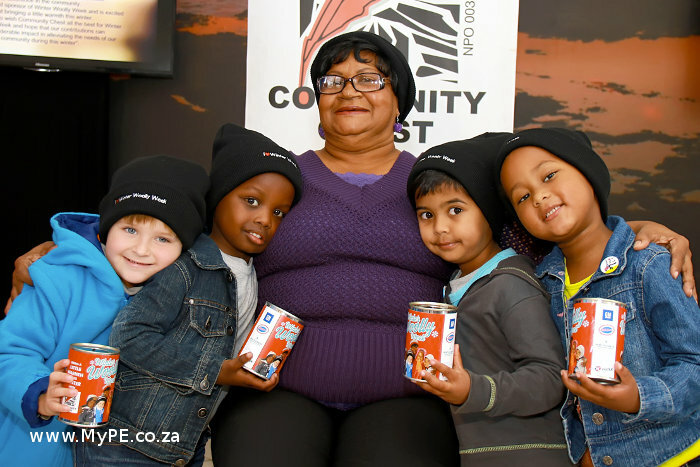 With Winter stretching out its icy grip over the Eastern Cape, the Community Chest today launched its annual Winter Woolly Week. The aim of Winter Woolly Week is to assist people in disadvantaged communities in the province who are adversely affected during the cold winter months. The project was started by Community Chest in 1995 after discovering the huge need for warm clothing, blankets and food. For the past five years General Motors South Africa (GMSA) has been a proud partner in this event. In addition to a cash donation from GMSA to the Community Chest, the company’s employees are encouraged to contribute clothes and blankets. “One of General Motors’ core values is to serve the communities in which we operate, with Winter Woolly week we aim to achieve this objective,” said Thanusha Pillay, GMSA public relations officer. She added that the company will further extend their involvement with an employee activation. “This year our employees will donate items, volunteer at intersections to collect warm items from the public and participate in tin collections at major shopping malls in the city,” said Pillay. According to Colette Theron, Community Chest public relations officer, the focus of Winter Woolly Week this year will be to assist families and individuals who have lost everything during unexpected disasters, assist registered soup kitchens with gas, gas stoves and ingredients and invest in building proper structures for day care centers and to provide clothing and blankets to those in need. “We thank our sponsors who generously support this initiative and help us achieve our mandate in the community. Their commitment and passion towards this project has restored hope for many and created a platform where the needy know that Community Chest is just a phone call away,” said Theron. The public are invited to donate items of clothing, blankets or food on 12 June 2015. Collection points on this day will be on the corners of William Moffett/Cape road, Fig Tree/Moffett on Main, Stanford Road/Aubrey Street and Five Ways on Cape Road from 06:00 to 08:30. Items can also be dropped off at collection boxes that will be placed at all participating Caltex Service Stations throughout the Eastern Cape from 8 to 12 June. Collection tins will be on hand for those who do not have items to spare. Other sponsors that have pledged their support to the project are Algoa FM, Eastern Cape Box, Caltex and the Port Elizabeth Airports Company.